Tonight, Trinity Hall presented a selection of rums from various Caribbean locales and representing different styles based on the influence of the European settlers there. It’s always fun to experience the uniqueness of these cultural interactions and tonight was no exception. Here’s what Marius, the proprietor, picked for us tonight. English Harbor 5 Year Old Rum – hailing from Antigua, this rum has molasses and dark fruit on the nose with a taste of light brown sugar, cane, white pepper then turns negative with some rubbing alcohol that pretty well ruins it. There’s a bit of leather on the finish but it’s dominated by a tannic, industrial taste and the overall experience is thin. Definitely not recommended. 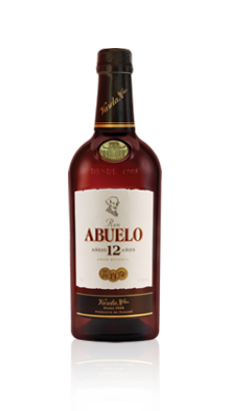 Ron Abuelo 12 Year Old – This Panamanian Rum opens with an aroma of molasses, tobacco, raisin, pecan praline and butter and continues with an engaging taste of molasses, toffee, vanilla, cane syrup and tobacco. The finish is cane syrup, leather and a continuing note of tobacco, making this a rich and flavorful rum that you have to try! Plantation XO 20th Anniversary Rum – This edition is a blend of 12-20 year old rums from Barbados that is finished in Pierre Ferrand Cognac casks. It’s full of vanilla, but of the artificial variety, along with toffee and sweet honeysuckle, butterscotch candy and nutmeg. The artificial flavors and sweetness carry through to the finish making this somewhat disappointing. Ron Zacapa 23 Centennario – This is a very popular Guatemalan Rum that I haven’t had in a while. From start to finish the dominant impression is sweet and syrupy. There’s a smell of sugary cherry syrup and a taste of sugary vanilla and toffee, cherries, prunes with some black pepper and tobacco adding the only interesting balance. The finish is sweet and flavorful, but too syrupy and simple. If you like sweet and simple, this is an overpriced version that you could probably do without. Look for something cheaper. Appleton Estate 21 Year Old Jamaican Rum – While this does have the typical Jamaican funk (caused by the esters from fermented additions to distillate), this is a terrible representative of the style. In short, it’s pretty awful! Once you get past the vanilla, dark fruit, rotten banana peel, molasses and black pepper, you’re met with rubber and other industrial flavors that ruin the experience. Ron Zacapa XO – Another Guatemalan rum from Zacapa aged in ex-cognac casks, but this time the range is 6-25 years old (presumably the ages represented in the solera system that they use, which means diminishing amounts as the age increases). This is a definite improvement over Zacapa 23, with an aroma of red grape, cherry and straw and a perfectly expected follow-through of the same with molasses, prune, vanilla, tobacco and black pepper on the palate. To be honest, this tastes more like a Spanish brandy than a rum and you might be better off going that route for more flavor and complexity at a better price. Balcones Texas Rum (batch 16-1) – This is one of the latest rum batches from Balcones and still a fairly limited offering. It’s a huge 63% ABV and takes a lot of water to bring the burn under control. Once you get there, it might even start to resemble rum ;-). By far the boldest offering of the evening (after all it’s from Texas! ), the nose offers toffee, corn, honey and dark cherry, while the taste is the typical tannic Balcones profile (there is a distinct taste to all of their offerings) with toffee, corn, vanilla, ginger, black pepper and white pepper followed by a long, leathery, spicy and peppery finish. It’s not your typical rum, but well worth the unique experience. See my review of Batch 13-1 to see how this rum has improved since the first batch. These tastings are about weeding out the riffraff as much as they are about discovering great spirits to enjoy and I accomplished both tonight. The clear winner is Ron Abuelo 12 Year, which I highly recommend for under $40. It’s sweet for sure, but it retains a really nice, complex flavor even so (I’d love to taste an unadulterated version of this one). Aside from the Balcones offering (and only because of it’s uniqueness), I would stay away from all of the others. As a side note, I would recommend Cardenal Mendoza Spanish Brandy Solera Gran Reserva for about $50 as a much better experience of what Ron Zacapa XO is trying to offer. Trust me, you’ll be glad you did! Posted in Rum. Tagged Anchor, Appleton, Balcones, Barbados Rum, Cuban Rum, Demerara Rum, Jamaican Rum, Plantation Rum, Ron Abuelo, Zacapa. 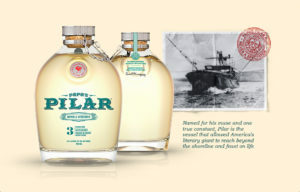 Evoking the name of Ernest Hemingway’s boat, Papa’s Pilar Blonde is a blend of rums from Florida, the Caribbean and South America that are solera-aged using ex-bourbon and port wine barrels before being blended, then finished in Spanish brandy barrels. I picked up a sample of this a while back because it was cheap and the grenade-like full-sized bottles looked cool. I’m glad that I didn’t bother with a larger bottle, but I’m getting ahead of myself. The aroma is full of nuts, milk chocolate and vanilla with a lot of sweetness. The taste is similar, except I’ll change the chocolate to white and specify the nuts as of the macadamia variety. There’s also a peppery bite with a bitter chocolate and nut finish. It’s simple and very un-rum-like, but that’s not the problem. It’s unbalanced and artificial tasting… very artificial tasting. Don’t bother with this one unless you like artificial chocolate and nut flavors with vanilla and pepper. Posted in Rum. Tagged Demerara Rum. I’ve been enjoying this rum for quite some time and it’s become a favorite of mine, even though it has recently come under fire for undeclared additives (a significant amount of sugar), effectively destroying the presumed purity of this Caribbean classic. I know… what a way to open a review! That’s definitely a digression, so let’s start from the top. The nose is a rich entanglement of molasses, prunes, vanilla, straw, sweet tobacco, overripe pear, honey, charred oak, pomegranate, wet grass and ginger. There’s the slightest amount of heat, but it’s mostly sweet and rich with just a note of musty leather. The taste is similarly sweet, rich, flavorful and mildly hot. Initially sweet, the flavors arrive in waves of fruit followed by waves of spice as you anticipate the transition to a slightly leathery, fruity finish with a bit of musty bitterness. The first wave brings sweet tobacco, caramel, prunes and honey followed by a wave of pear, molasses, vanilla, bitter orange, overripe banana and fresh straw. Next a wave of charred wood, ginger, plantain and white pepper overlap the previous wave and then both fade into the finish. It’s really interesting to note the arrival of the flavors with each sip and this experience keeps the entire pour desirable and pleasurable. The sweetness is noticeable, but not objectionable. I just wish I could experience it without the added sugar. At the current $32 per bottle, this is truly a bargain for a masterpiece of history and flavor. Of all the rums that I’ve tasted, this is the most alluring… almost calling me whenever I glance at the bottle. There are better rums for sure, but this is definitely a favorite. 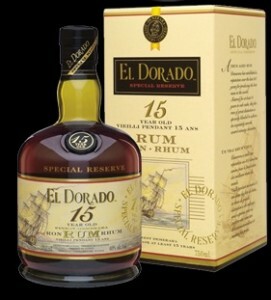 If you want a cheaper introduction to El Dorado Rum, then give the 8 Year Old a try at less than $20… you’ll be amazed! I hope to give the sweeter 12 Year Old a try this year. Update: I’ve received some offline comments from my good friend, Cap’n Jimbo, so I’d like to offer some clarifications. The fact that Demerara Distillers adds sugar to a premium offering like El Dorado 15 Year, especially 31 g/l (among the highest in the industry), is truly disheartening. This is effectively a pollution of the Demerara style which they represent and a sad omen for things to come with respect to their products (I hope I’m wrong about this, at least for their premium offerings). I still think that El Dorado 15 Year is a great tasting rum and has some complexity and flavor robustness that is rare in the $30 range; however, it is no longer representative of the Demerara style of rum that it once was. I say this because I have it on good authority that the addition of sugar is a recent change and, in my opinion, a sad one. I’ll be on the lookout for good examples of the Demerara style, which is my favorite so far. At this point, my reference is Flor de Caña Centenario Gold 18 Year. Posted in Rum. Tagged Demerara, Demerara Rum.